"The former Fed chair is promoting his new book. He should admit his role in the housing crisis, not insult our intelligence. 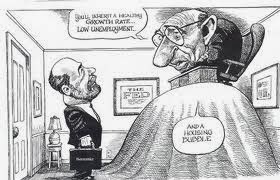 "Alan Greenspan will go down in history as the person most responsible for the enormous economic damage caused by the housing bubble and the subsequent collapse of the market. The United States is still down almost 9m jobs from its trend path. We are losing close to $1tn a year in potential output, with cumulative losses to date approaching $5tn. "These numbers correspond to millions of dreams ruined. Families who struggled to save enough to buy a home lost it when house prices plunged or they lost their jobs. Many older workers lose their job with little hope of ever finding another one, even though they are ill-prepared for retirement; young people getting out of school are facing the worst job market since the Great Depression, while buried in student loan debt. 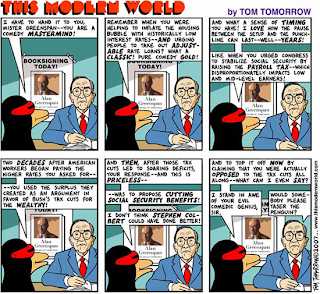 "The horror story could have easily been prevented had there been intelligent life at the Federal Reserve Board in the years when the housing bubble was growing to ever more dangerous proportions (2002-2006). But the Fed did nothing to curb the bubble. Arguably, it even acted to foster its growth with Greenspan cheering the development of exotic mortgages and completely ignoring its regulatory responsibilities. 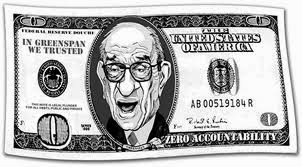 "Most people who had this incredible infamy attached to their name would have the decency to find a large rock to hide behind; but not Alan Greenspan. He apparently believes that he has not punished us enough. 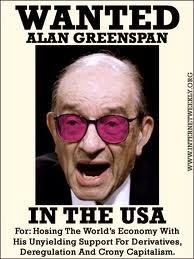 Greenspan has a new book which he is now hawking on radio and television shows everywhere. "The book, which I have not read, is ostensibly Greenspan's wisdom about the economy and economics. But he also tells us that his problem as Fed chair was that he just didn't know about the flood of junk mortgages that was fueling the unprecedented rise in house prices during the bubble years. He has used this ignorance to explain his lack of action – or even concern – about the risks posed by the bubble. 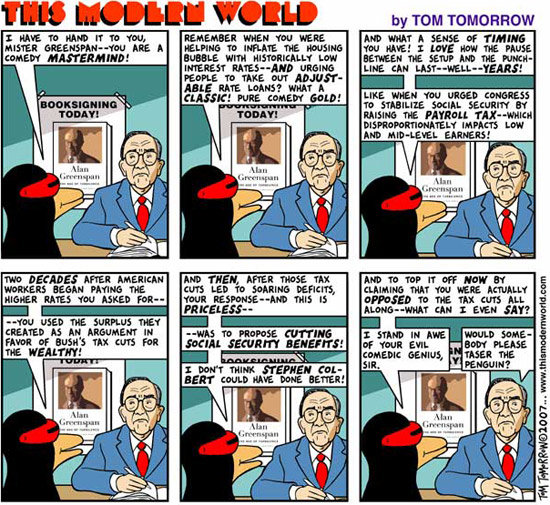 "Greenspan's 'I didn't know' excuse is so absurd as to be painful. The explosion of exotic mortgages in the bubble years was hardly a secret. It was frequently talked about in the media and showed up in a wide variety of data sources, including those produced by the Fed. In fact, there were widespread jokes at the time about 'liar loans' or 'Ninja loans'. The latter being an acronym for the phrase, 'no income, no job, no assets'. "The fact that banks were issuing fraudulent mortgages by the millions, and that the Wall Street crew was securitizing them as fast as they could get them, was not top secret information available only to those with special security clearance. This was the economy in the years 2002-2006. "It was impossible to look at the economy in these years and not see the role of the housing bubble and the tsunami of bad mortgages that fueled it. The run-up in house prices led to a near record pace of construction. Typically housing construction is around 4.5% of GDP. It peaked at 6.5% in 2005. Greenspan didn't notice? Who did he think was going to live in all these units, the building of which had created record vacancy rates as early as 2003? "And he didn't notice that the spike in house prices had led to a surge in consumption pushing saving rates to nearly zero? He actually co-authored several pieces on exactly this topic with another Fed economist. Between the 100% predictable collapse of residential construction and the plunge in consumption that would follow the loss of the housing wealth that was driving it, we were looking at a loss of more than $1tn in annual demand. 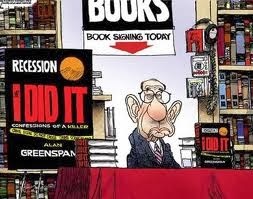 What did Greenspan think would fill this gap, purchases of Ayn Rand's books? "Greenspan had all the information that he could have possibly needed to spot the housing bubble and to know its collapse would be really bad news for the economy. More than anyone else in the country he was in a position to stop the growth of the bubble. "Suppose that, instead of extolling the wonders of adjustable rate mortgages, Greenspan used his public addresses to warn people that they were buying into an overpriced housing market; and he warned investors that the subprime mortgage backed securities they were buying were filled with fraudulent mortgages. Suppose further that he used the Fed's research staff to document these facts. "Greenspan could have used the regulatory powers of the Fed to crack down on the bad mortgages being issued by the banks under the Fed's jurisdiction, as his fellow governor Edward Gramlich urged. And, he could have arranged to have a meeting with other federal and state regulators to see what they were doing to prevent mortgage fraud in the financial institutions under their jurisdictions as well. "Those are the actions that we had a right to expect from a Fed chair faced with the growth of a dangerous asset bubble. 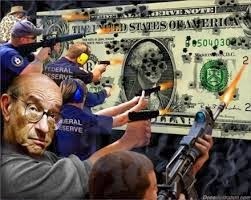 That is what Alan Greenspan would have done if he had been earning his salary. Instead, he did nothing. He cheered on the bubble until it burst and then he said it wasn't his fault. "This man has nothing to tell the country about the economy and the media is not doing its job to imply otherwise. If Greenspan doesn't have the decency to keep himself out of public view after all the damage he has done to the country, then the media should do it for him. The only thing he has to say that would be newsworthy is that he's sorry." "WASHINGTON — For years, a Congressional hearing with Alan Greenspan was a marquee event. Lawmakers doted on him as an economic sage. 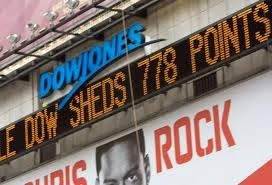 Markets jumped up or down depending on what he said. Politicians in both parties wanted the maestro on their side. "But on Thursday, almost three years after stepping down as chairman of the Federal Reserve, a humbled Mr. Greenspan admitted that he had put too much faith in the self-correcting power of free markets and had failed to anticipate the self-destructive power of wanton mortgage lending. "'Those of us who have looked to the self-interest of lending institutions to protect shareholders’ equity, myself included, are in a state of shocked disbelief,' he told the House Committee on Oversight and Government Reform. "Now 82, Mr. Greenspan came in for one of the harshest grillings of his life, as Democratic lawmakers asked him time and again whether he had been wrong, why he had been wrong and whether he was sorry. "Critics, including many economists, now blame the former Fed chairman for the financial crisis that is tipping the economy into a potentially deep recession. Mr. Greenspan’s critics say that he encouraged the bubble in housing prices by keeping interest rates too low for too long and that he failed to rein in the explosive growth of risky and often fraudulent mortgage lending. "On a day that brought more bad news about rising home foreclosures and slumping employment, Mr. Greenspan refused to accept blame for the crisis but acknowledged that his belief in deregulation had been shaken. "He noted that the immense and largely unregulated business of spreading financial risk widely, through the use of exotic financial instruments called derivatives, had gotten out of control and had added to the havoc of today’s crisis. 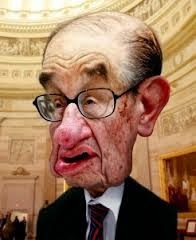 As far back as 1994, Mr. Greenspan staunchly and successfully opposed tougher regulation on derivatives. "But on Thursday, he agreed that the multitrillion-dollar market for credit default swaps, instruments originally created to insure bond investors against the risk of default, needed to be restrained. "Mr. Waxman noted that the Fed chairman had been one of the nation’s leading voices for deregulation, displaying past statements in which Mr. Greenspan had argued that government regulators were no better than markets at imposing discipline. "'Were you wrong?' Mr. Waxman asked. "'Partially,' the former Fed chairman reluctantly answered, before trying to parse his concession as thinly as possible. "Mr. Greenspan, celebrated as the 'Maestro' in a book about him by Bob Woodward, presided over the Fed for 18 years before he stepped down in January 2006. He steered the economy through one of the longest booms in history, while also presiding over a period of declining inflation. "But as the Fed slashed interest rates to nearly record lows from 2001 until mid-2004, housing prices climbed far faster than inflation or household income year after year. By 2004, a growing number of economists were warning that a speculative bubble in home prices and home construction was under way, which posed the risk of a housing bust. "Mr. Greenspan brushed aside worries about a potential bubble, arguing that housing prices had never endured a nationwide decline and that a bust was highly unlikely. "Mr. Greenspan, along with most other banking regulators in Washington, also resisted calls for tighter regulation of subprime mortgages and other high-risk exotic mortgages that allowed people to borrow far more than they could afford. "The Federal Reserve had broad authority to prohibit deceptive lending practices under a 1994 law called the Home Owner Equity Protection Act . But it took little action during the long housing boom, and fewer than 1 percent of all mortgages were subjected to restrictions under that law. "This year, the Fed greatly tightened its restrictions. But by that time, the subprime market as well as the market for other kinds of exotic mortgages had already been wiped out. "Mr. Greenspan said that he had publicly warned about the 'underpricing of risk' in 2005 but that he had never expected the crisis that began to sweep the entire financial system in 2007. "Many Republican lawmakers on the oversight committee tried to blame the mortgage meltdown on the unchecked growth of Fannie Mae and Freddie Mac, the giant government-sponsored mortgage-finance companies that were placed in a government conservatorship last month. 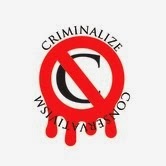 Republicans have argued that Democratic lawmakers blocked measures to reform the companies. "'The evidence strongly suggests that without the excess demand from securitizers, subprime mortgage originations (undeniably the original source of the crisis) would have been far smaller and defaults accordingly far lower,' he said. "Despite his chagrin over the mortgage mess, the former Fed chairman proposed only one specific regulation: that companies selling mortgage-backed securities be required to hold a significant number themselves. 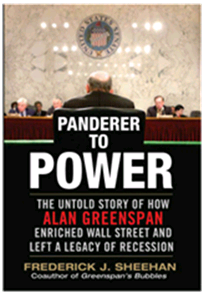 And after all this time, what had Ayn Rand disciple, husband of MSNBC's Andrea Mitchell, Alan Greenspan wrought? "The United States is still down almost 9m jobs from its trend path. We are losing close to $1tn a year in potential output, with cumulative losses to date approaching $5tn." Notice some of the conflation between the two articles, as Greenspan's denials swarm like lying flies over his deadened eyes as the Times article notes, "It was impossible to look at the economy in these years and not see the role of the housing bubble and the tsunami of bad mortgages that fueled it," yet as the second article says, "...he failed to rein in the explosive growth of risky and often fraudulent mortgage lending." If it's not the Conservatives that are lying our way into another financial disaster, it's the criminal Conservative cartel that spins their lies, as the GOP puppets continue their relentless march into deregulation and Reaganomics, knowing in the meantime that Trickle Down "economics" and deregulation don't work. Harmless lies or criminal behavior - if you can make the obvious choice, don't forget to make it count when you vote next November.